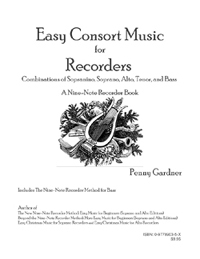 This 66-page volume of consort music uses only the 9 easiest notes. The table of contents shows the voicing of each song. May be played by a mixed consort of recorders and C instruments, like guitar, harp, or psaltery. Nine-Note Recorder Method. PDF for you to print, $5. Print up to 10 copies for $40.